This is a RARE, newer and hardly worn CARTIER RONDE Collection Privte in solid PLATINUM, measuring 34.5mm. and a slight and slim 11.2mm. thin with sapphire display back, revealing the finely crafted SWISS, CARTIER manual winding movement. Notice the original CABOCHON tipped winding crown and crystal clear sapphire crystal. This watch retains its’ original 18k. white gold CARTIER deployant buckle. The silver, guilloche dial has ROMAN NUMERALS and blued steel hands, exhibiting that simplistic, elegant flair that many collectors seek. The original alligator band is without creases. This fine and rare CARTIER is waterproof to 30 meters. This CARTIER is marked number 18. 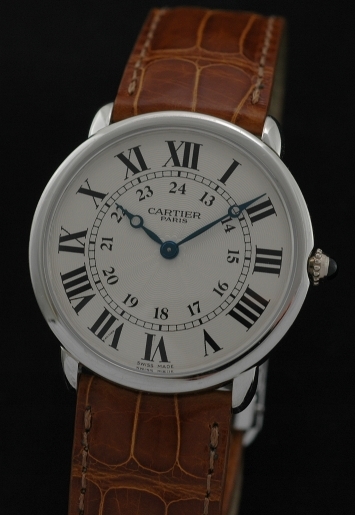 I really must stress the fact this CARTIER is rare…discontinued and very desirable, with no other examples available for sale on the internet. Only $13,950.